Cottage in the quiet and spacious hillside. Equipped with every comfort and full of privacy.Functional and welcoming. With a large panoramic terrace for dining with all comforts. Located in greenery, ideal for families and groups of friends. Guests have a large swimming pool with sun loungers. 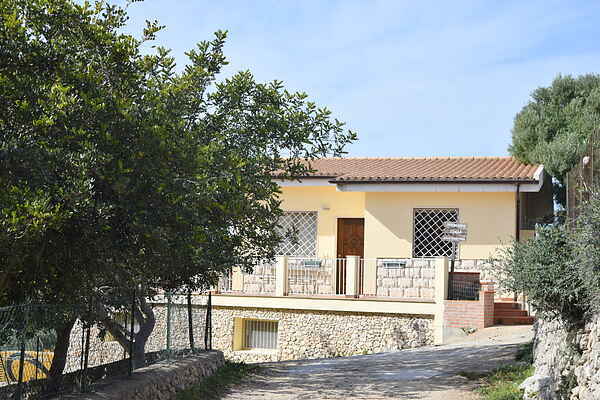 Housed in a farmhouse in a magnificent location in the heart of Monti Iblei.Guests will be welcomed with kindness and attention in a serene, festive and family typical of the famous Sicilian hospitality. In the lodging facility is a farm that is open to visitors with various poultry, cows, goats, pigs and donkeys, the children can always help the friendly owner to feed the animals; the farm produces excellent wine and olive oil, cheese, milk, eggs and jams. This is the perfect place for those seeking a relaxing holiday in the countryside a short distance from the sea and the ancient city of Syracuse. The beaches are beautiful stretches of white sand and clear sea. Famous those of Fontane Bianche (fine sand and turquoise sea paradise), Arenella and Calamosche. There are many restaurants and beach facilities with umbrellas and chairs rental. The farm has an excellent restaurant serving traditional open for the full Sunday lunch, a bar and a pub serves cakes, the delicious farm products and beverages. The South-East of the island, in particular, offers an incredible range of places to visit, real gems of art, architecture and nature under a sky always clear and bright. The routes to be discovered are manifold and through thousands of years of history, with the overlap of many cultures and civilizations that have made Sicily a magical and multifaceted. Even nature offers amazing jewelry: the sandy or rocky, nature reserves rich in wildlife; the Mediterranean and then the city ': the baroque, unique and precious, the Greek and Roman archaeological sites; again: the atmospheres and styles Arabs and Normans Syracuse, with the island of Ortigia and the rest of the districts on the mainland (especially the archaeological park of Neapolis); but also its province, Unesco heritage that finds its culmination in Noto, to the extreme southern tip, with Vendicari and then the territory Ragusa with Modica and Ragusa Ibla, to remember two other baroque wonders.